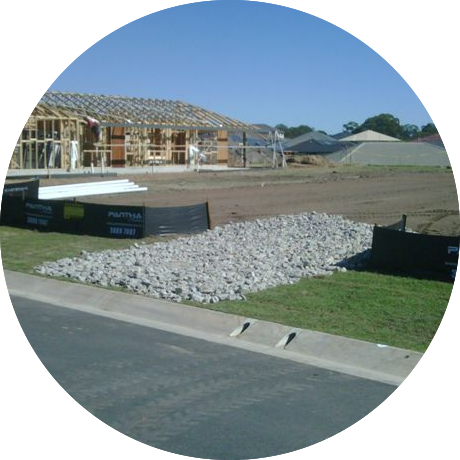 Our focus is on adequately protecting the site from run-off and soil erosion. Our trenching machines and attachments are designed to penetrate the most difficult soil conditions to install fencing at the correct depth. We use a high quality woven polypropylene fabric that is manufactured to meet Australian Standard ISO9001:2001 Accreditation) Our fabric has a high UV rating and is attached to the stakes using air driven staples. We only use Australian Hardwood stakes and these are driven into the soil with specifically designed pneumatic post drivers. difficult soil conditions to achieve the correct depth. attached to the pegs using air-driven staples. 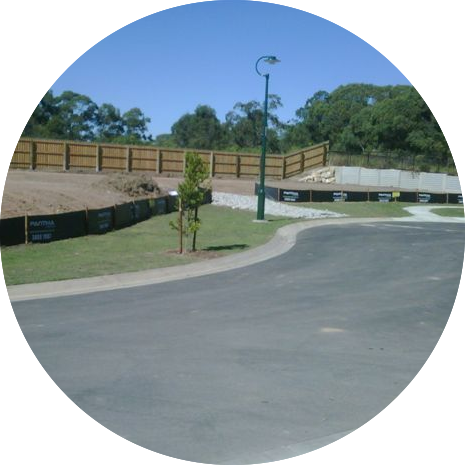 We use Australian hardwood pegs driven into the soil with specifically designed pneumatic post. 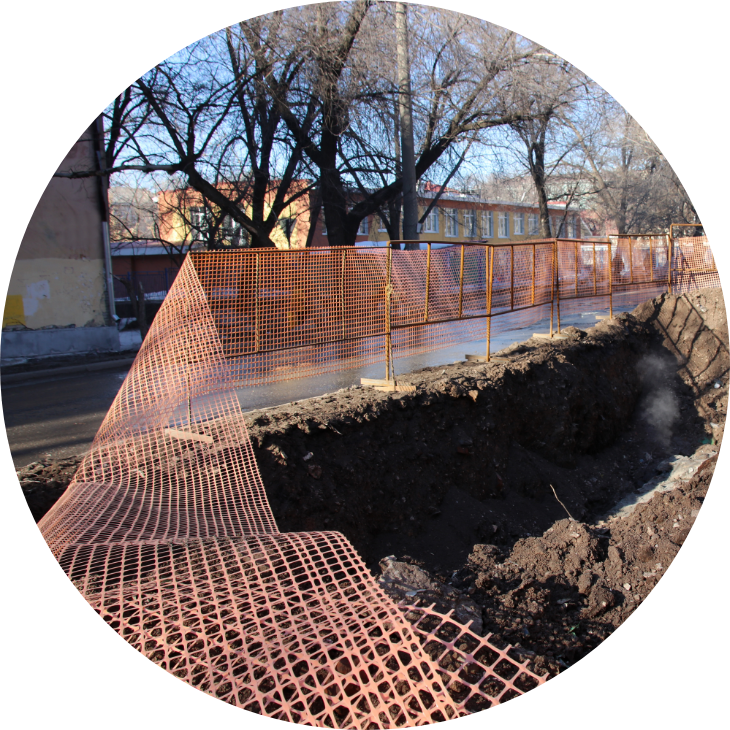 We are aware of the requirement under the Workplace Health and Safety Regulations for the provision of safety barriers around excavations on building sites so Vidgil Silt Fencing also provides this service to our clients. Gravel crossovers can be provided using 40 – 60 mm crushed concrete/gravel. Note: Service fee for maintenance depends on the work required and may not incur a charge. Contact us today to design a package to meet your needs! HOMES by CMA have used Vidgil on all of our homes for the last 5+ years. They are easy to work with and meet all of our construction needs everytime.We do not hesitate in recommending their services to any business. Metricon have been using Vidgil Silt Fencing for over 8 years now. The team are very reliable and always eager to assist with any matters on site. They are certainly one of Metricon's preferred suppliers. We have worked with Vidgil for over 10yrs & have always found their service to be excellent, timely & professional. The Vidgil team have always go above & beyond for us, & we wouldn't hesitate to recommend them to any organisation looking for great value, high quality & reliable service. We have been using Vidgil Silt Fencing for over three years and have always found the Vidgil team to be both efficient and professional at all times. We look forward to continuing our relationship with Vidgil moving forward. We have been using Vidgil Silt Fencing since 2015. They provide an efficient, quality service. G.J. Gardner Springfield really values our relationship with Vidgil. We've been working together for sometime & they are our sole silt fencing supplier. Reliable & trustworthy in all matters. We specifically deal with Cathy Dickson & nothing is too much trouble. We definitely recommend working with Vidgil. CSR relies Vidgil on to maintain compliance on our development & quarry sites. Vidgil’s proactive approach on strategies to provide cost effective solutions for sediment & erosion control on our sites is of great value to our business. I would not hesitate to recommend Andrew & the Vidgil team.